At almost any given time there are easily 20 to 30 exhibitions on view at Yale University, most of them free and open to the public. In addition to some of the most popular venues — Yale Peabody Museum of Natural History, Yale University Art Gallery, Yale Center for British Art, and Beinecke Rare Book and Manuscript Library — Yale’s renowned collections are on view in spaces not widely known by the public. A sampling of Yale libraries this fall illustrates a range of subjects, from 19th century medical illustrations to contemporary artist books to medieval law. Library exhibitions are free and open to the public during business hours and most weekends, with some spaces requiring a Yale I.D. for admission after 6 p.m. For complete information, visit the Yale University Library’s website. A new exhibition at the Cushing/Whitney Medical Library lends an historical perspective to the role of technology in delivering 21st-century medical care. 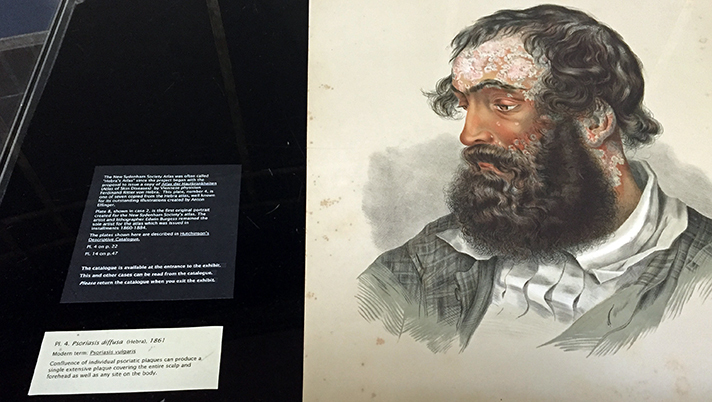 “Historical Illustrations of Skin Diseases” features 25 intricately drawn chromolithographs from a 19th-century “Atlas of Skin Diseases,” published by the New Sydenham Society in London. “Ichthyosis hystrix (Hebra),” Plate 6 from “The Atlas of Skin Diseases,” published in 1861 by The New Sydenham Society. The Cushing/Whitney Medical Library, Yale University. The society sought to disseminate medical information from Europe by making important papers, essays, and case studies available in English translation as soon as possible to subscribers. Published in 17 parts over 24 years (1860–1884), the atlas illustrated diseases ranging from the common (psoriasis and eczema) to the rare (ioderma and epidermal nevi), including systemic diseases such as Addison’s disease and lupus. An accompanying catalogue, published by Jonathan Hutchinson, the society’s secretary, provided information about each plate. The illustrations are of actual patients, taken from life and rendered in watercolor before being printed. In their introduction, the publishers noted the portraits are “probably unequalled by anything of like kind either in this country or on the continent.” Not many of the atlas’ 4,000 copies survive in full. The one on view at Yale belonged to Harvey Cushing (Yale Class of 1891), a pioneering neurosurgeon and Sterling Professor of Neurology at the Yale School of Medicine. 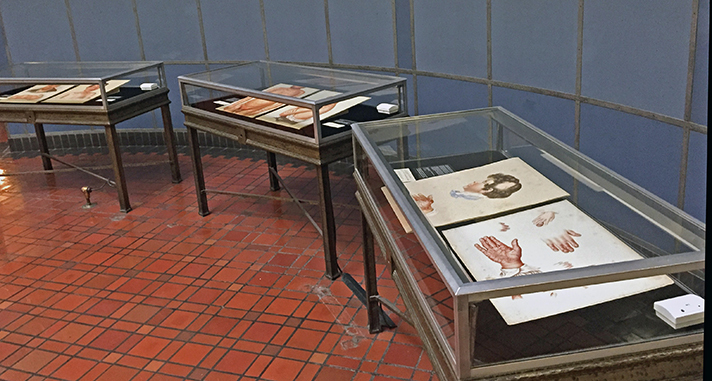 The exhibit is curated by Jean Bolognia and Irwin Braverman, professors of dermatology at the Yale School of Medicine, and Susan Wheeler, curator of prints and drawings at Cushing/Whitney library. In an introduction to the exhibition, Braverman writes that the atlas “serves as a rebuttal to the conceit of modern man that information derived more than a generation earlier is not worth considering.” He also notes that the atlas illustrates modern ideals of clinical medicine today, such as detailed case histories and thorough physical examinations. “Contrast that with today’s often unfortunate approach where a briefly elicited clinical complaint is immediately investigated by imaging and panels of tests in order to establish the diagnosis, many times with an unnecessary waste of time, money, and resources,” writes Braverman. In 1998 Braverman worked with Linda Friedlaender, curator of education at the Yale Center for British Art, to develop the pioneering class “Enhancing Observational Skills,” which uses original works of art to help first-year medical students hone their observation skills. The course has since been adopted by more than 40 medical schools in the United States and abroad. Turning from the hand-drawn to high-tech, an exhibition at the Center for Science and Social Science Information (CSSSI) showcases faculty research via a digital media wall. 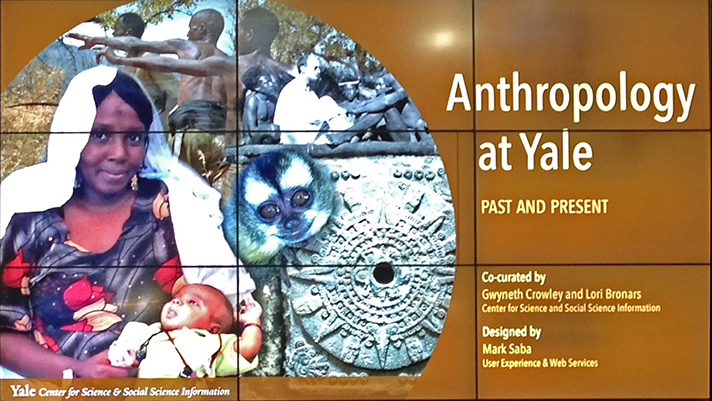 “Anthropology at Yale” is the sixth media exhibition since the CSSSI opened in 2012. Curated by librarians Gwyneth Crowley and Lori Bronars, and designed by Mark Saba, Yale ITS, the presentation is a 12-minute loop that highlights research by current faculty members and emeriti in the Department of Anthropology — founded in 1937 — as well as those who were part of the program in the early 20th century. The exhibition pairs photos of faculty members with information about their areas of research, noted published works, and photos and video of field work, illustrating the ways that anthropology intersects with multiple departments across the university, from the Institute for the Preservation of Cultural Heritage, to the MacMillan Center for International and Area Studies, to agrarian studies, vertebrate zoology, and the Global Health Initiative. Kline Biology Tower 219 Prospect St. 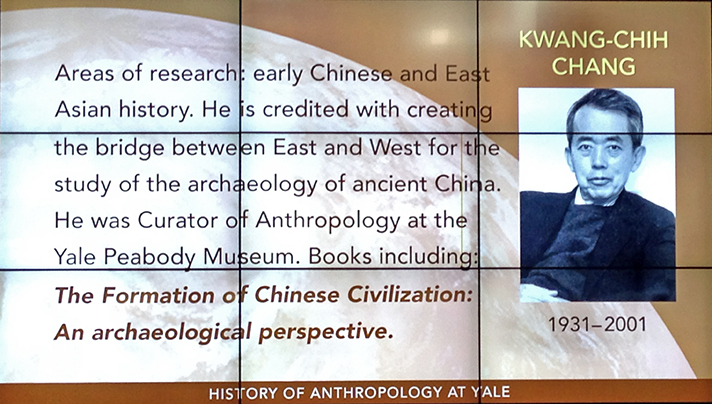 Historical figures include Bronislaw Malinowski (1884–1942), considered the founder of social anthropology; Kwang-Chih Chang (1931–2002), credited with creating the bridge between East and West for the archaeological study of ancient China; Leopold Pospisil (b. 1923), who pioneered the anthropological study of law; and George Grant MacCurdy (1863–1947) ’1905 Ph.D., known around the world for his research and publications on human evolution and Paleolithic archaeology. Current faculty members who are highlighted include Professor David Watts, who studies the behavioral ecology of nonhuman primates; Assistant Professor Louisa Lombard, who studies African borderland areas where the state is largely absent; Assistant Professor Narges Erami, who works on the relationship between economy and religion in the holy city of Qum in Iran; and professor emeritus Michael Coe, one of the world’s foremost scholars of Mayan culture. 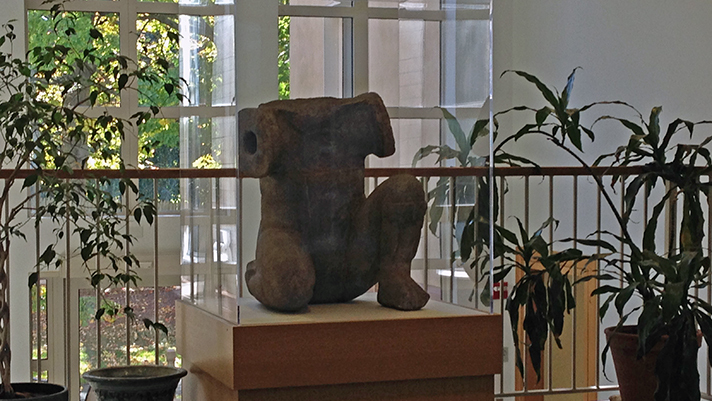 Some of the objects highlighted in the exhibition can be seen in Yale collections, such as a basketry dance costume of a wild boar from Papua New Guinea (pictured with Pospisil, professor and curator emeritus of anthropology) and a kneeling statue from Veracruz, Mexico (pictured with Coe) — both on permanent display in the Department of Anthropology at 10 Sachem St.
Another historic faculty member is the subject of an exhibition at the Yale Divinity School Library. “Roland H. Bainton: A Yale Divinity School Treasure” features letters, photographs, writings, and artwork by Bainton (1894–1984), a renowned church historian, artist, and storyteller, who graduated from Yale and taught at the Divinity School from 1920 to 1962. Professor Roland Bainton on his bicycle. Photo courtesy Yale Divinity School Library. Born in Ilkeston, England, Bainton received a Bachelor of Divinity degree at Yale in 1917 and his Ph.D. in 1921. During World War I he served in the American Friends Service Committee, a Quaker service organization that assisted civilian victims. Following the war he taught at Yale — he was named Titus Street Professor of Ecclesiastical History in 1936 — and became an ordained Congregational minister. 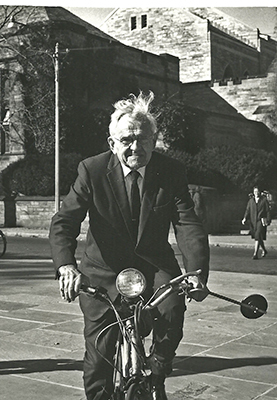 In his later years he lived on the Divinity School campus, riding his bicycle up and down Prospect Street to his office at Sterling Memorial Library well into his 80s. Bainton was an authority on the Reformation and the life of Martin Luther. He authored 32 books and was known for his annual recitation of ”Luther’s Christmas Sermon” at the Divinity School’s Christmas celebration. 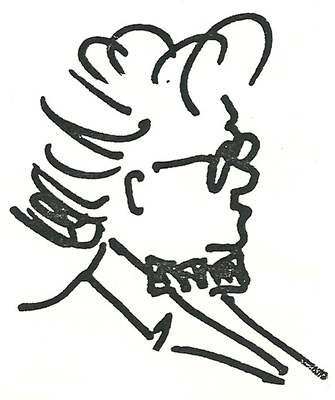 In addition to his writings and memorabilia, the exhibition also includes a selection of Bainton’s caricatures of fellow faculty members, for which he was famed. 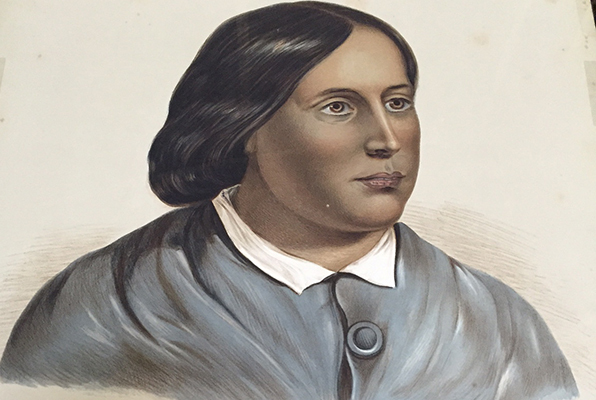 “Roland H. Bainton: A Yale Divinity School Treasure” was organized by Martha Smalley, special collections librarian and curator of the Day Missions Collection at the Divinity Library. The Divinity Library holds more than 5,000 linear feet of archival collections related to the history of missions and world Christianity, the ecumenical movement, religion at Yale, and the Divinity School. 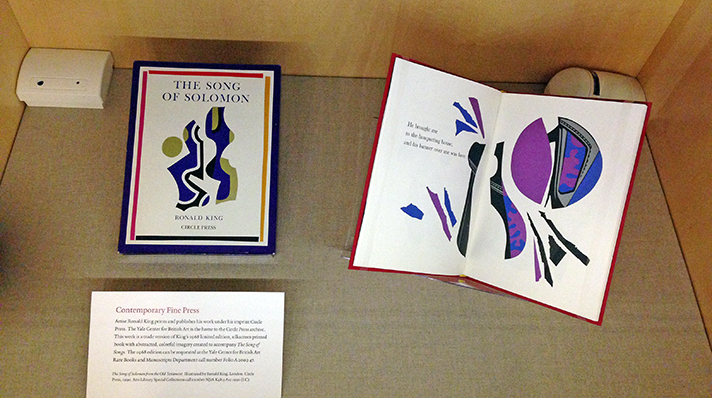 The Divinity Library’s collections are also represented in another exhibition at the Robert B. Haas Family Arts Library. They join works from the Arts Library Special Collections in “‘How right they are to adore you!’ The Song of Songs Interpreted Through Fine Printing,” curated by Jae Rossman, associate director for library operations and public programs. “The Song of Songs,” also known as “The Song of Solomon” or “Canticles,” is a biblical book of poetry found in both the Hebrew Bible and in the Christian Old Testament. For more than a century, modern and contemporary artists and fine printers have been inspired by the collection of love poems. Artists Robin Price and Barbara Benish will speak about their forthcoming edition of “The Song of Songs” on Tuesday, Nov. 10 at 3 p.m. at the Sterling Memorial Library lecture hall. Stahl notes that rabbis interpret the book as an expression of God’s love for the people of Israel, while Christian theologians understand it as a song about the love of God for his church. “In its plain meaning, however, ‘The Song of Songs’ is about spring, youth, love, and yearning,” writes Stahl. On view are cases of artists’ books, limited edition works, and fine press books from a range of international artists using a variety of techniques, including wood-block prints, lithographs, silk-screen images, die-cut pages, calligraphy, and hand lettering. Some are traditional books, while others are loose-leaf, hand-bound, folded paper, or scrolls. A 1923 German limited edition book is illustrated in the Art Nouveau style — popular in the late 19th and early 20th centuries — by Ze’ev Raban, a leading Israeli artist. Each page spread features selected verses surrounded by a decorative border on the left and a separately printed color lithograph illustration on the right. 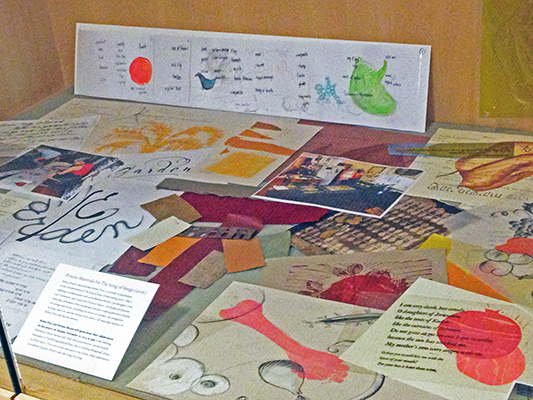 Connecticut artist, printer, and publisher Robin Price is working with artist Barbara Benish, type designer Liron Lavi Turkenich, and vocal artist Victoria Hanna on her own interpretation of “The Song of Songs.” The exhibition features the project in process, including materials and design decisions, such as choice of typeface and integration of image and text. Price will create eight scrolls — one for each chapter of “The Song of Songs” — referencing the pre-codex book format during Biblical times. Another highlight of the exhibit is “The Saint John’s Bible,” a project sponsored by the Benedictine monks of St. John’s Abbey in Collegeville, Minnesota, who produced what is likely the first completely hand-written and hand-illuminated Bible in over 500 years. Renowned calligrapher Donald Jackson designed a new script for the text and employed 10 artists and scribes to produce the seven-volume set. Traditional materials were used for the original work: parchment; lamp black ink; bird feather quills; natural pigments; and gold leaf. On display is a limited edition volume from the Heritage Edition, a high quality reproduction of the original manuscript version. In September, Pope Francis presented one of 12 copies of the Apostles Edition to the American people during his address to the United States Congress. It now resides in the Library of Congress. 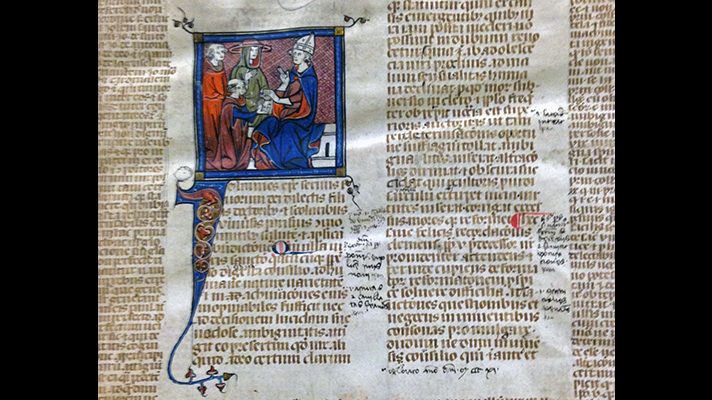 A 14th century manuscript of the “Clementinae constitutiones,” by Pope John XII. The image depicts the pope handing the book to scholars, symbolizing the official promulgation of the text. The Lillian Goldman Law Library, Yale University. 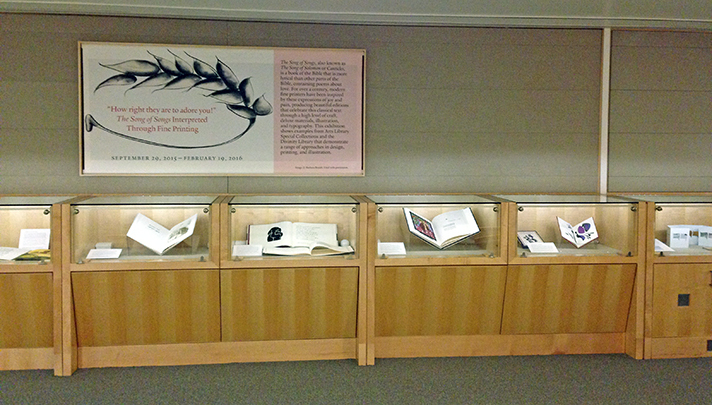 The exhibition features books and manuscripts from the law library’s Rare Book Collection and the Stephan Kuttner Institute of Medieval Canon Law, which became part of the Yale law library in 2013. Ranging from the 14th to the 20th centuries, they illustrate how the papacy has shaped areas as diverse as human rights, due process, and marriage law. Winroth and Widener note that the pope’s legal decisions became precedents, inspiring secular law and becoming the recognized authority in the law of marriage, the law of just war, and the legal implications of oaths. A talk by curator Anders Winroth will take place on Tuesday, Nov. 10 at 12:10 p.m. in Rm. 128 at Law Library (Guests may bring lunch and beverages.) The exhibition catalogue is available for viewing online. The idea of natural rights — what we today call human rights — was first outlined by the jurist Gratian, who in the 1130s became the first academic teacher of canon law. 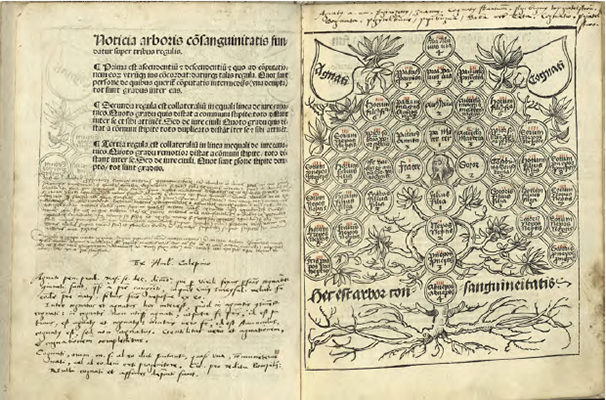 On view is a 16th-century copy of his book, which holds that the right to keep and educate children, and to acquire the fruits of the earth and its waters, are common to all people, irrespective of religion and ethnicity. Another book shows how medieval jurists expanded on Gratian’s ideas. In the early 14th century the law teacher and cardinal Johannes Monachus, commenting on a law issued by Pope Boniface VIII, became the first jurist ever to state the central principle that a suspect is presumed innocent until proven guilty. A papal bull (written statement) from 1567 by Pope Pius V, on display in the exhibit, extended the prohibition against dueling to bull fights — the “bull bull” — creating an early precedent for animal rights protections. And even Satan got his day in court, or at least mock court. The exhibit includes a late-medieval narrative, printed in 1505, which amused generations of law students by positing what would happen if Satan sued Christ, demanding the return of humankind. The papacy lost much of its judicial and legislative power following the Reformation and the growth of the modern state. Popes continued to issue laws, but most of these were only valid inside the church. One of the most famous cases of the period is that of King Henry VIII of England, who married his brother’s widow, Catherine of Aragon, in spite of a law that prohibited a man from doing just that. The pope had granted the king special dispensation, but when Catherine failed to produce a male heir, Henry divorced her, claiming that the pope had acted unlawfully by allowing the marriage. 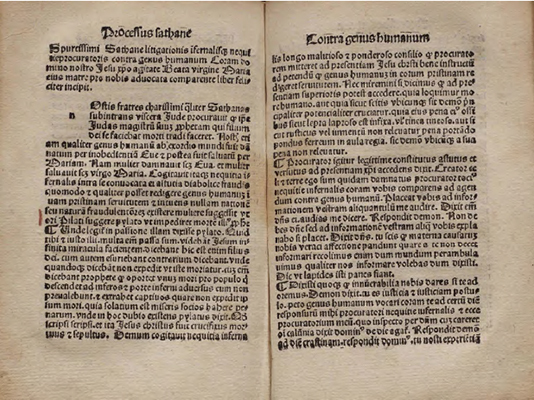 A 1531 pamphlet asserting that European law schools agreed with Henry’s interpretation is on view in the show. Like all of Yale’s curators, Winroth and Widener say they hope that their exhibition will inspire visitors to explore the collections for teaching, learning, and research.